Cakes Originally uploaded by wjharrison77. At noon things were not looking good. Not only was the rain bucketing down on the Highland Games arena, our main tent had blown down in the gales. The wild weather meant the school’s stage could not be taken outside and the Highland dancers worried that their delicate foot pumps would become sodden dancing on the wet grass. Only two stalls were set up. From the staffroom window where I stood the sports field looked empty and distinctly wintry. We were all concerned about the weather preventing activities from taking place. We were especially worried that the weather would deter people from coming. Despite this, everyone was determined to make the best of the situation and enjoy the night no matter what happened. It was a spectacularly good night. The teamwork and efforts of the pupils and staff was phenomenal. I’ve always been delighted to be a part of the school but last night I was bursting with pride. For the majority of the night I was on duty selling tickets and directing traffic but I did have some time to wander around and soak up the atmosphere. The vast majority of the crowd were locals which created a real sense of community, one that is becoming rare these days. It was fun to meet the families of the kids and to bump into ex-pupils. I laughed to see two local boys, known in school for being rough lads, walking around proudly with a pair of perfectly groomed toy poodles – “This one took first place in the Toy category, Miss,” one proudly told me. The tearoom was a roaring success. 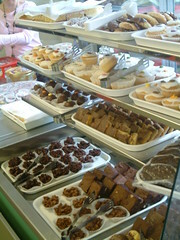 There were was a vast selection of goodies ranging from traditional scones and crispy cakes to quirky sugared mice and continental biscotti. I asked how my cakes had sold and was delighted to discover that not only Holler’s Mum’s fruitcake and Johanna’s grubs had been snapped up quickly, the chocolate brownies that I fretted over had been extremely popular too! Just as the games were coming to an end the heavens opened and the rain came down but those of us who remained didn’t care much about getting wet. 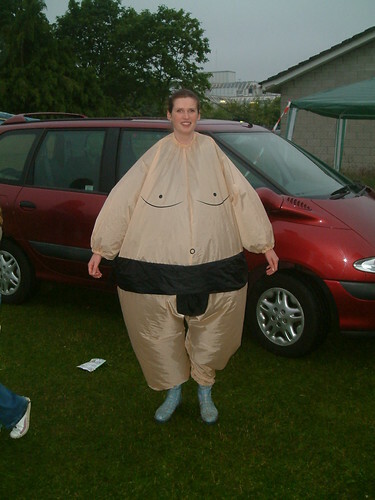 I ended the night dressed in an inflatable sumo wrestlers costume bouncing in the pouring rain to one of the school’s rock bands. A perfect end to an amazing night. Today everyone is exhausted. Staff and pupils alike are wandering the corridors with tired, happy smiles on their faces, eating the leftover cakes and talking about how we’ll make the event even better next year. Nice outfit Wendy ! Sounds like everything turned out AOK! I knew your baked goodies would be a hit. Always good for the soul to hear a good success story! Too Fun! Gen – I know! He won the “waggiest tale” and “dog the judge most wanted to take home” categories. The important ones! What a great day it turned out to be! You were so lucky with the weather, I know as I am just a few hours south of you! It has been good weather for ducks! Sounds like everyone had fun, liked your costume! Thanks Holler. 🙂 We were lucky indeed! Nice shot , Wendy! I love it! I am so glad the games were a success there is nothing better than Highland Games! So much fun! Jen – Have to agree!